Advice From Rebbetzin RLZ: Surely you remember Rebbetzin Rivka Leah Zelwig from Pesach As She Outta Be? And the language she spoke from Yeshivish As She Is Spoke? Well, here is Rebbetzin RLZ once again, in an idyllic setting, setting up her family's sukkah. And Abq Jew promises not to call you Shirley! 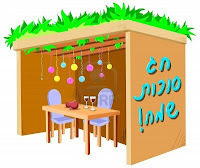 Now go build your Sukkah!